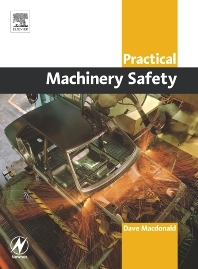 Practical Machinery Safety aims to provide you with the knowledge to tackle machinery safety control problems at a practical level whilst achieving compliance with national and international standards. Appendix D: Notes on PUWER. Dave Macdonald has throughout his career been involved in the application of instrumentation and control technology to industrial and chemical processes. As a senior instrument engineer with AECI Ltd he specialised in managing the complete design cycle for process control systems from conceptual design to commissioning. He has also developed and lectured a post-graduate course in Industrial Control Systems. Dave has been closely involved in hazard studies for new chemical plants and in the implementation of safety instrumented systems. His expertise ranging from field instrumentation to software quality assurance is particularly relevant to this subject.. In the past few years Dave has lectured on Safety Instrumentation and related topics to many hundreds of Engineers and Technicians in Ireland, Canada the UK, Australia, New Zealand and South Africa.